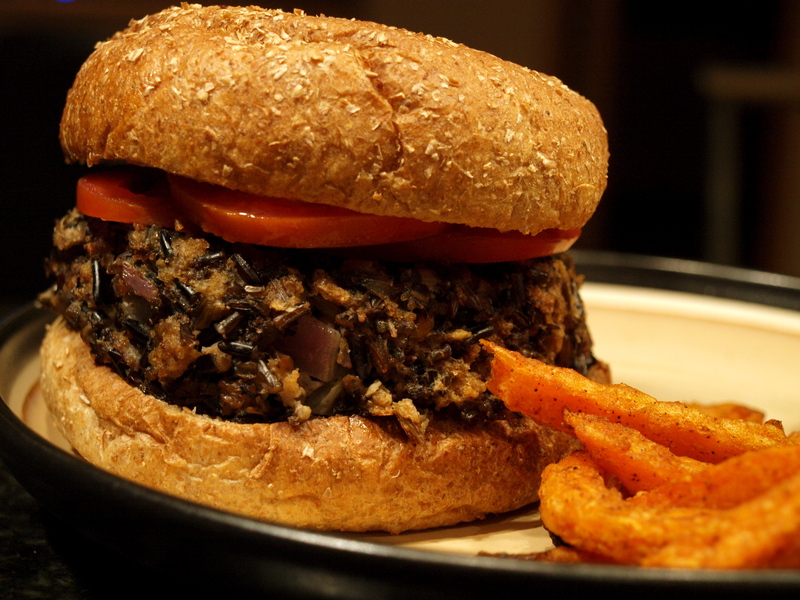 As a long-time meat-free, food-obsessed chick, I’m a veggie burger connoisseur of sorts. If I’m in a hurry (okay, or lazy) I will grab a frozen patty, but this is never anything special. When I go out to dinner, it’s a whole different story. As soon as I see “house made” near the words “veggie burger,” I dive right in and don’t look back. While my enjoyment varies with each burger, I always order them mostly out of curiosity. Home made veggie burgers have never turned out really well for me, so if someone is willing to serve me one, bring it on, baby. A cute lakeside restaurant brought it on big time when the boy and I went to Duluth for our anniversary last October. 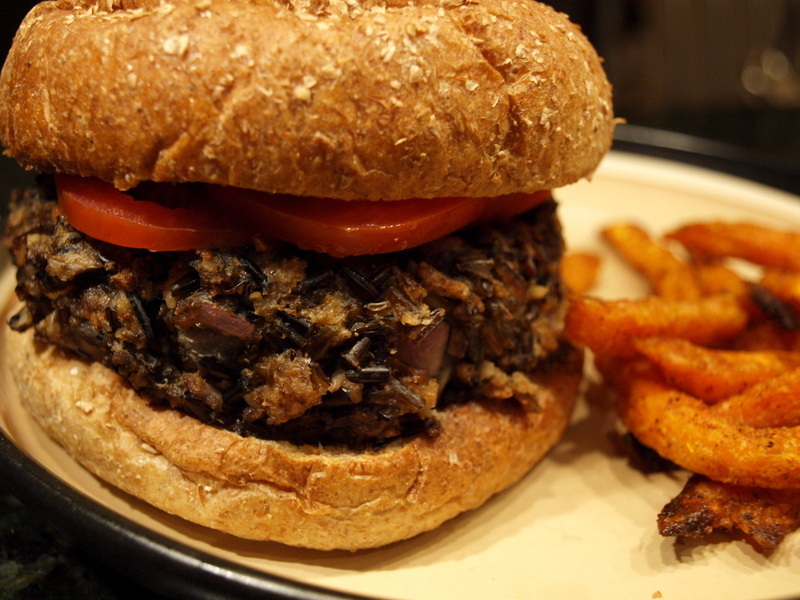 After devouring a “house made” wild rice burger on the restaurant’s patio, the boy mentioned an affection for wild rice, and suggested we bring the “house made” patty into an actual home sometime soon. Wary yet excited, I agreed to let the carnivore in on a veggie burger trial in the near future. One of my favorite aspects of hand-built burgers is the size, the sheer size that makes me question if I can even extend my jaw to fit its height, but always makes me want to try. I wanted to mirror this element in my burger, so I found a recipe that would be a base, and ran with it like the breezy girl that I am (note: read this last sentence with a touch/an absurd amount of sarcasm). Start out by getting the rice going, because that’s the most time-intensive part of this recipe (and it’s still only 25 minutes…score!). I bought cracked wild rice, and what worked for me is one cup rice to 3 cups water. To give the burger a “meaty” flavor, I sprinkled some steak seasoning into the water. If you don’t have steak seasoning I suggest some coarse salt, pepper, and cumin. Bring the water to a boil, add the rice and stir so it’s distributed evenly (no one likes unevenly cooked rice, word? word). Cover the pot and turn the burner to low. Let it simmer for 25-30 minutes, then remove from heat and let it sit for a few minutes. While the rice is cooking, move onward with the other elements. 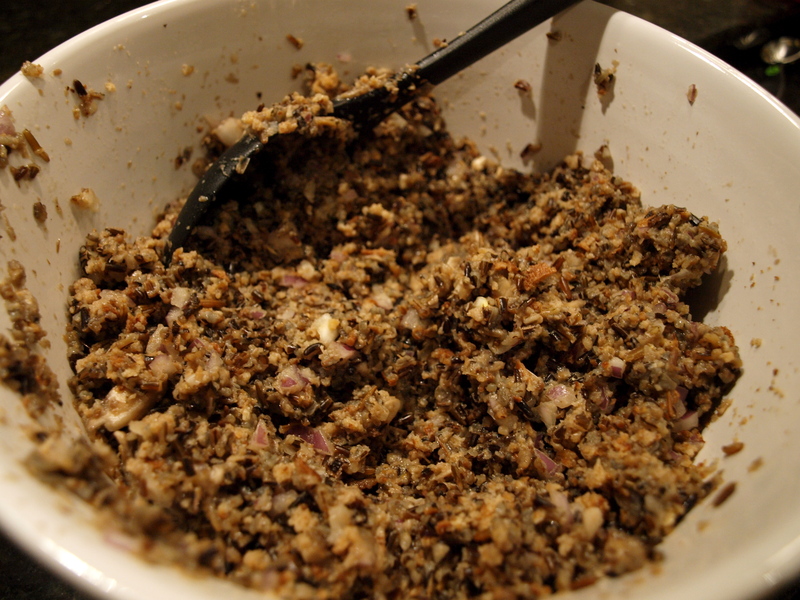 Pulse the mushrooms in a food processor until finely chopped. They will look disgusting, but just set them aside and don’t think about it. Break the toasted bread into chunks and process them until they morph into bread crumbs. Look at you! You just made your own bread crumbs, which are SO much better and economical than the bagged up version with the jacked-up price. You go girl (or boy, whatevs). Wisk together the two eggs, then add the garlic, onion, cheese, and mushrooms. Throw in a bit of salt and pepper. Add the rice and fully incorporate with the other ingredients. Take your homemade bread crumbs and add them slowly, folding together the mixture so that it’s a texture that’s not too wet, but not so dry that it doesn’t hold together. Form the patties by taking a handful, rolling it into a ball, and pushing it down. The boy ended up doing this, as he is a skilled patty-maker, whereas I am, well, messy and impatient. Place the patties on a greased cookie sheet, and bake for 12-15 minutes. When they’re ready you’ll notice the egg has done its job and given them more structure, and the tops will be somewhat golden. While the patties are turning from goopy mess to awesomeness, make a custom condiment. 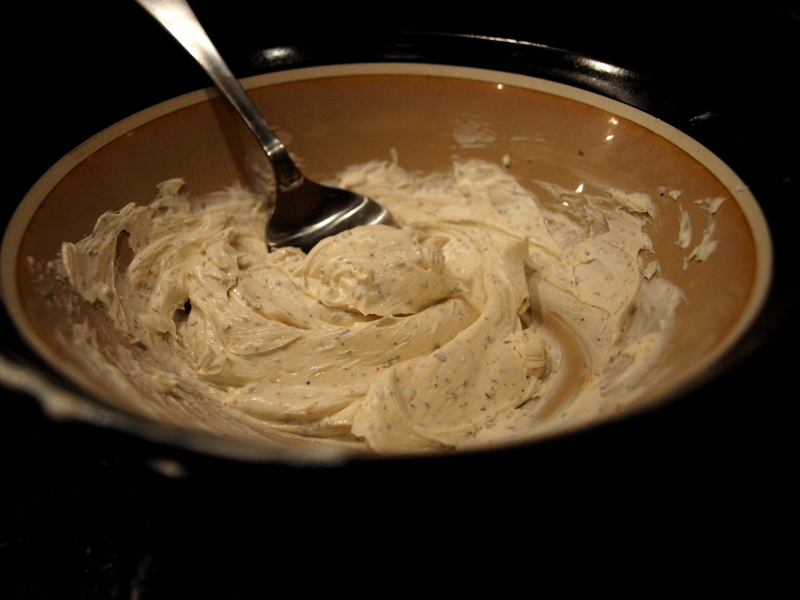 I have a really strong, irrational hatred for mayonnaise, but I love condiments, so I decided to simply stir together cream cheese and spices. I chose cayenne pepper, dried basil, and Lawry’s Seasoning Salt, but you can choose whatever your heart desires, because let’s be real, anything mixed with cream cheese is heaven. After you take the patties out, let them sit for a couple of minutes while you prepare the buns. I slathered some butter on the insides and broiled them until just starting to brown on the edges. When they are toasted to your liking, assemble your own masterpiece. 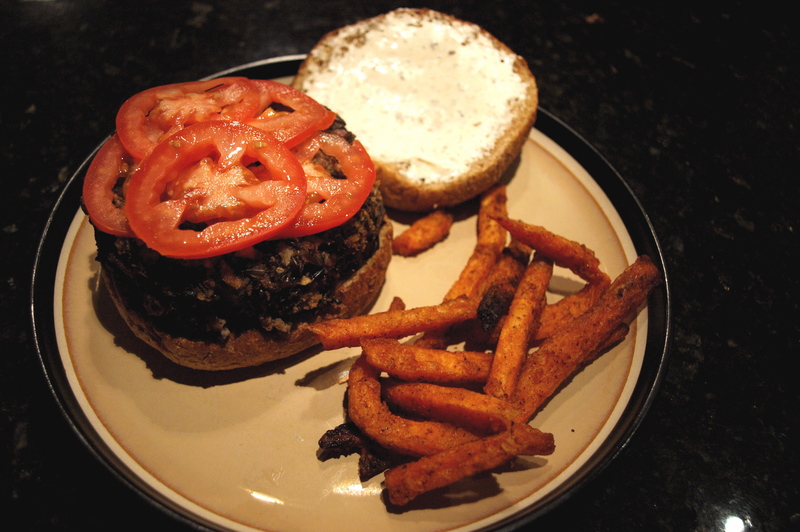 For me, I wanted to focus on the burger and the cream cheese, so I simply added some sliced tomatoes. To make the meal truly emulate the veggie burger restaurant experience, we had some Alexia Spicy Sweet Potato Fries on the side (which, btw WHOA…you should try those). This burger was everything I wanted it to be. It wasn’t too dry or too dense, and it held together well yet still allowed the wild rice to have a pleasant crumbly effect. The patty itself was a great mixture of salty and savory, while the cream cheese sauce gave a good kick to the burger without overpowering it. Of course the true test was the boy’s opinion. The boy who forms his own juicy lucy patties out of organic beef from his dad’s neighbor. The boy who laughs at my veggie burgers and scolds my tofu. Well that boy ate two of the monster burgers, and kept talking about the meal the next day. Of course he gave the props a spin of, “MAN that was a great idea I had.” To which I replied, “yes dear, stellar idea by you, rockstar execution by me.” Everyone wins. This entry was posted in Burger on December 11, 2011 by Katie.